Hi, it's Gaylynn here. 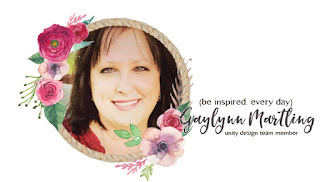 The Unity Stamp Co. and Brutus Monroe design teams are collaborating for a brand new release and blog hop. I am sharing two sweet cards made with denim stamping and each with a totally different look. We are also joining forces for a separate insta hop on Instagram. My first project is a sweet winter card featuring a bunny and trees along with background stamping using the Dance With Denim stamp, using a kraft color ink. I wanted to create the look of a path or walkway. I also framed the sentiment with the denim. 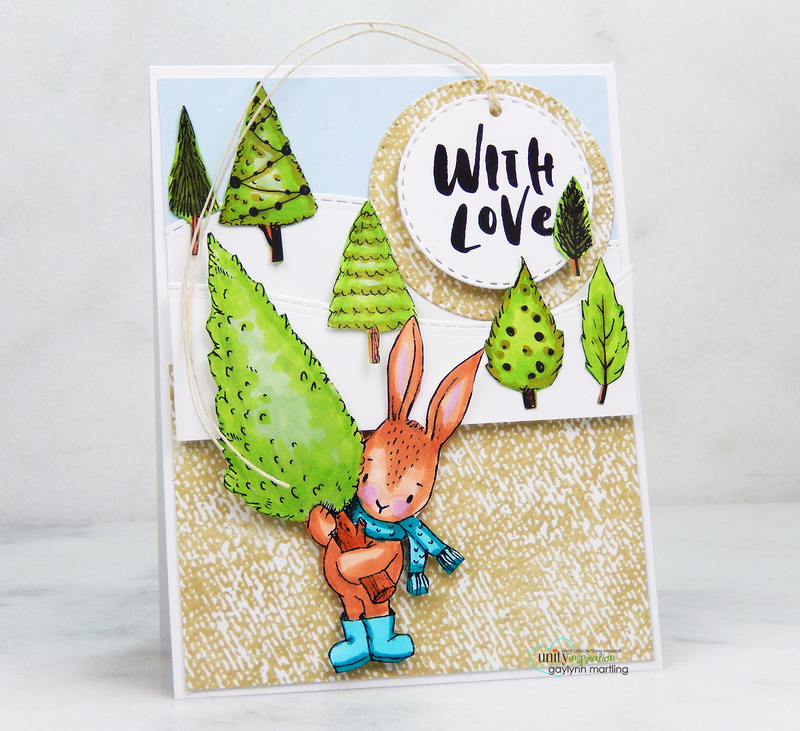 The sweet bunny and trees are by the super talented artist Lisa Glanz. 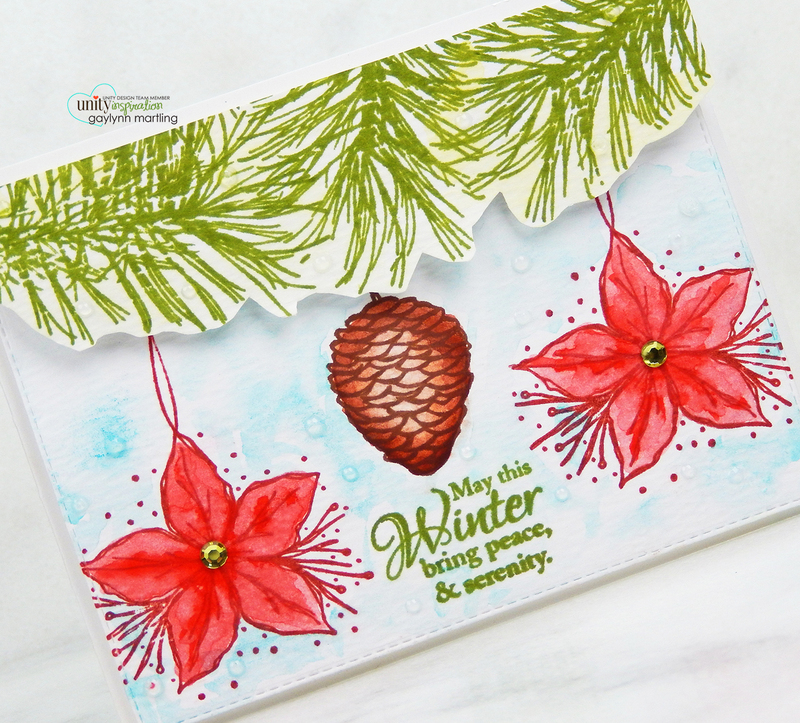 Here is the winter tree card video tutorial. 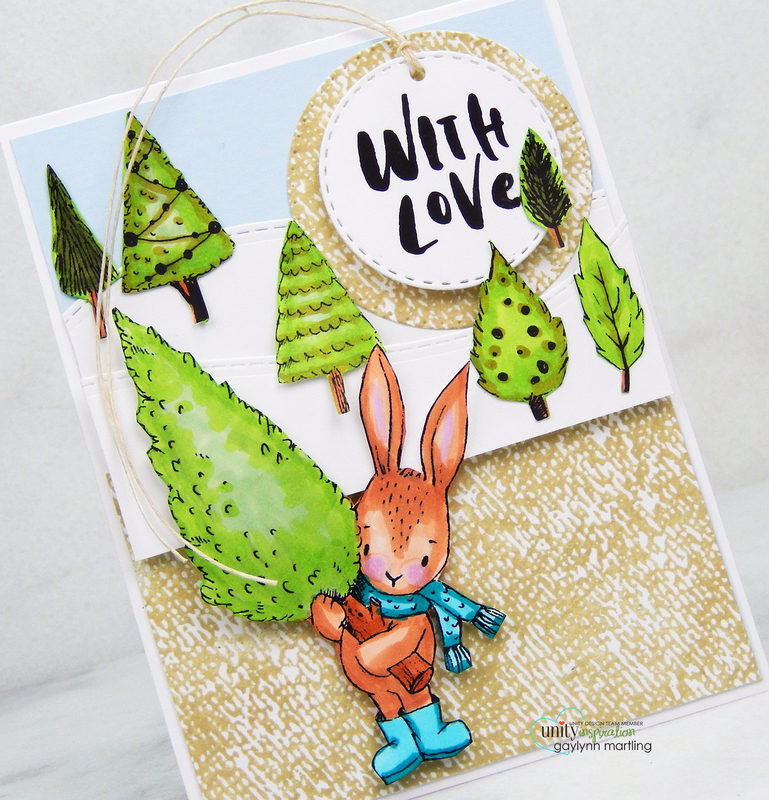 And here is another look at the bunny tree card. Bunny tree card supplies: Unity Stamp Co. Tree With Love by Lisa Glanz and Dance With Denim by Brutus Monroe; My Creative Time dies, MFT and SSS ink, original Misti, Copic markers G99, G21, YG13, YG95, BG53, BG49, V0000, V01, E11, E13 and E15. Sentiment: Don't be like the rest of them darling. My next sample has a completely different look, using the same denim stamp. 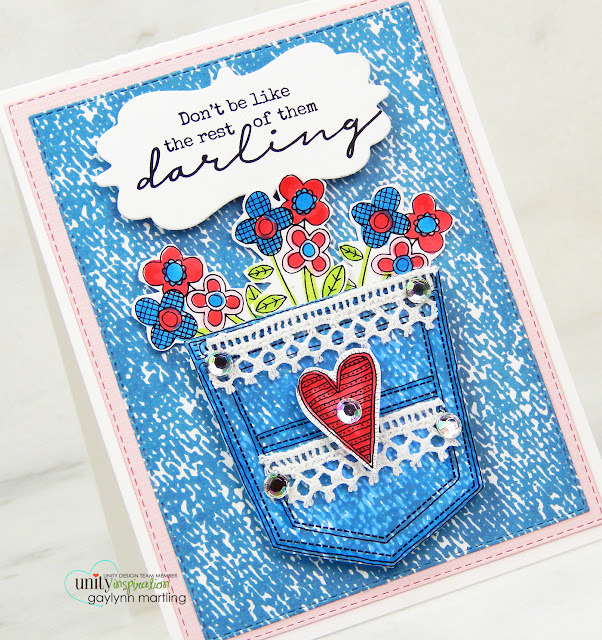 This one is a sassy blue jeans pocket card. I used the Brutus Monroe denim stamp to replicate the look of blue jeans with a decorated pocket. My quick video tutorial shows the pocket card process. Here is another look at the pocket card. Pocket Card Supplies: Unity Stamp Co. Dance with Denim by Brutus Monroe, Pocket & Patches and Things Will Work Out; Copic markers R35, RV11, B14, YG13; Ranger archival ink, original Misti, adhesive gems, lace and My Creative Time dies. We have FOUR amazing Unity filled prize packages, WORTH $100 retail each, to give away. Leave a comment on EACH hopper’s blog listed below for your chance to win. It is Watercolor Wednesday on the Unity blog. 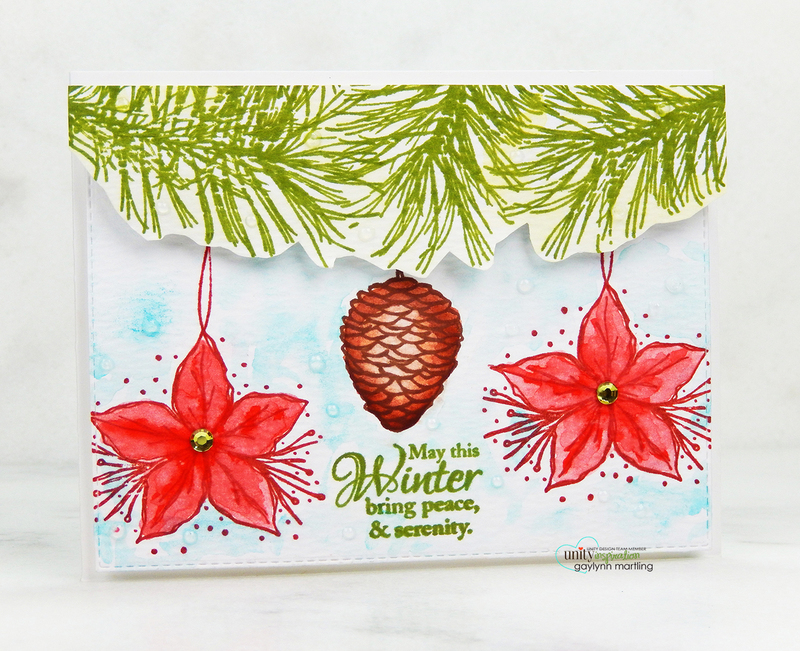 Today, I am using winter foliage stamps with watercolor and a little fussy cutting. Sentiment: May this Winter bring peace & serenity. This was stamped in three different ink colors. I used watercolor for the foliage and the background. The leaves were fussy cut to serve as a top border. To accent, I added adhesive rhinestones and lots of Nuvo drops to look like dew drops or snow. Supplies: Unity Stamp Co. Winter Blessings and A Christmas Hello; Ranger archival ink and watercolor paper, Altenew watercolor, watercolor brushes, My Creative Time dies, adhesive gems and Nuvo crystal drops. 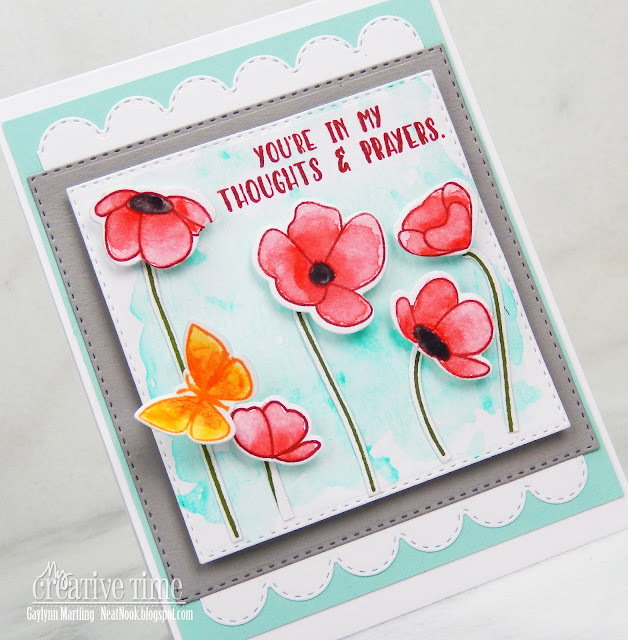 Today, on the MCT blog, we are sharing Thoughtful Tuesday projects. 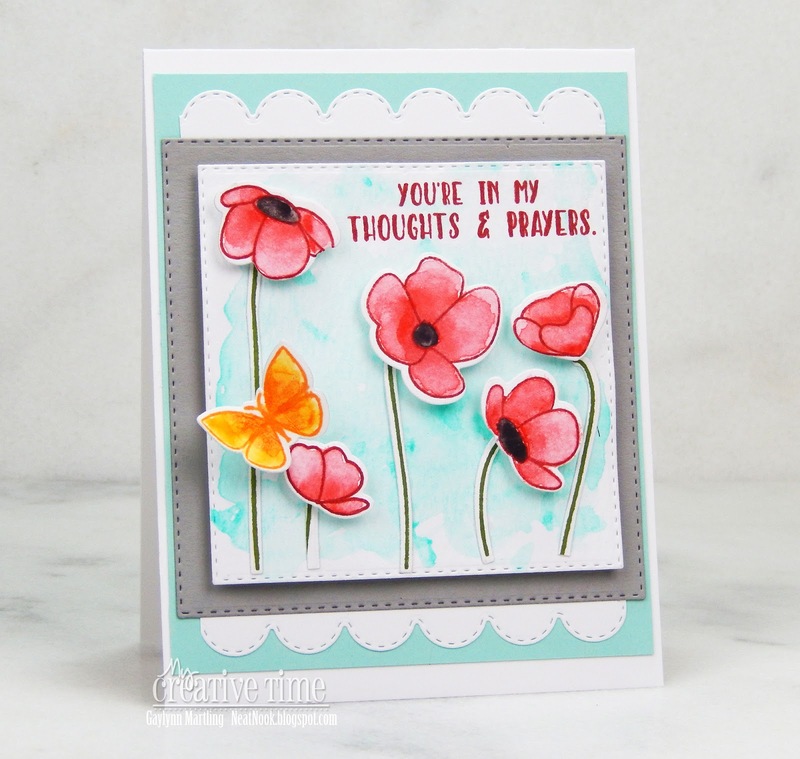 I am sharing a heartfelt card to have on hand for those times when someone needs a hug. I included poppy flowers and a butterfly. Sentiment: You're in my thoughts & prayers. This card was created as we remember both of our mothers. It has been over one year since their passing and just six months apart. They both loved to send and receive cards like this. For this, I used MCT stamps and dies. Watercolor was used on the flowers, the butterfly and the background. I love the soft look of it. Supplies: MCT stamps and dies (listed above); Ranger Archival ink and watercolor paper; Altenew watercolor and Pop Dots. Hi, it's Gaylynn here with a Thanksgiving or Autumn pumpkin tag and cake pop table decoration. It is the MCT 83rd Edition release, sale and blog hop. Here is a sweet way to add a personal touch to your Thanksgiving table place settings. 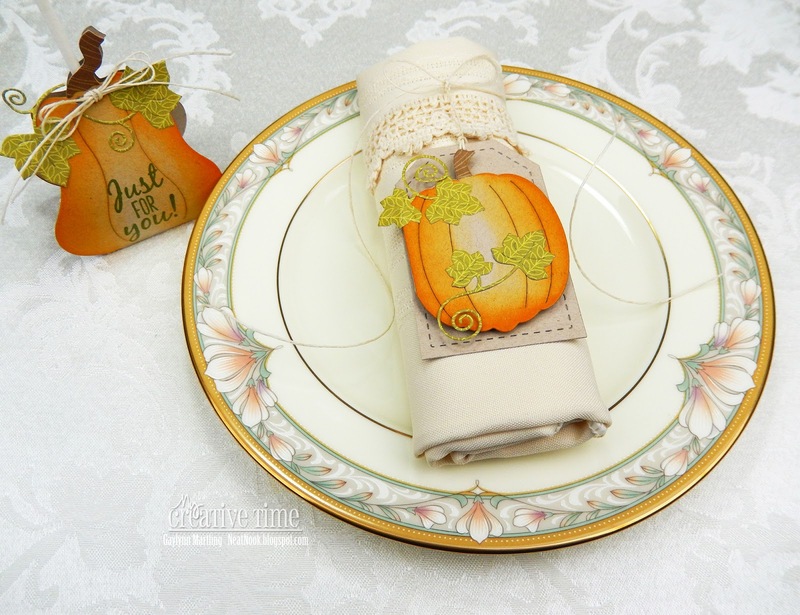 I made a pumpkin tag to place on the lace napkin ring. And I made a coordinating pumpkin shaped cake pop holder. It would be easy to write names on the napkin ring tags for seating assignments. I chose to leave them blank for now. ALSO, DON'T FORGET our sale starts RIGHT NOW in the My Creative Time store, here! Use the code: SEPT2018 to receive a discount off your entire purchase! This sale applies to "IN-STOCK" items ONLY. This sale will end on Friday, September 28, 2018 @midnight PST. Here is a closer look at the napkin ring tag. Starting on Friday, September 21, 2018 @ 8am PST, the first 50 shoppers will receive a special “ONE TIME ONLY USE” discount code that you can use anytime with the exception if there is a sale going on already! This special discount code will be given to the FIRST 50 shoppers! If you are one of the 1st 50 shoppers it will automatically be added to your package at the time of packing/shipping. PLEASE keep in mind, if you are the first 50 shoppers, do NOT throw away your invoices that are included with your orders because that is where your discount code will be! Welcome. The MCT team is sharing Day 4 sneak peeks of the 83rd Edition release. This card was made using the cute Autumn leaves. I die-cut them and then accented them with distress ink. I wanted a frame of leaves surrounding the sentiment panel. The colors are a mix of tan, orange, green and purple hues. 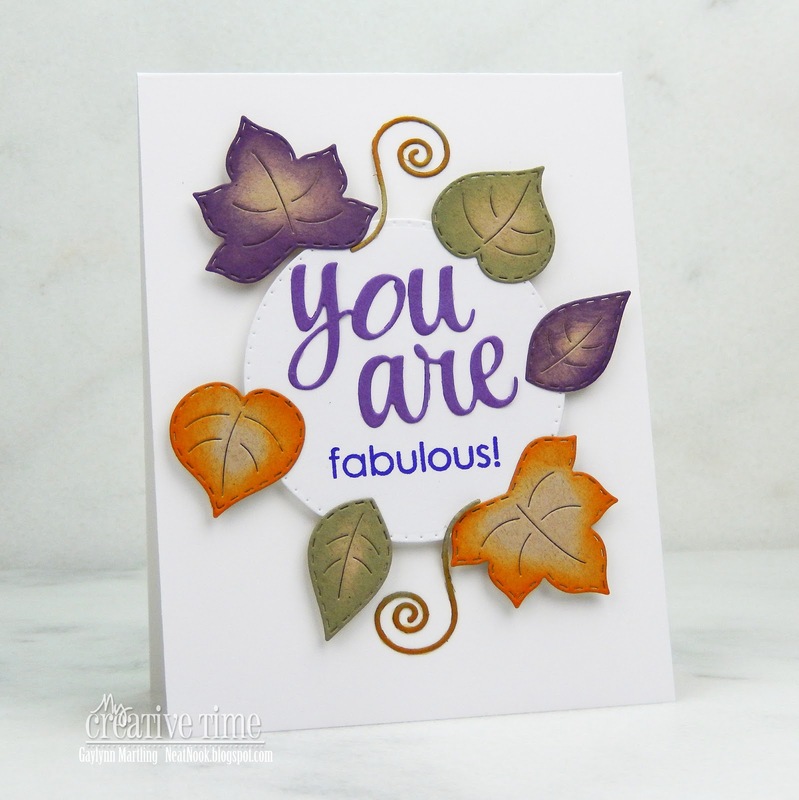 I think this card is great for Autumn, Thanksgiving, congratulations or most any occasion. Then check back tomorrow for the full reveal, sale and blog hop. It is Watercolor Wednesday on the Unity blog. I am sharing a way to add a vintage style watercolor background along with colorful heat embossing. Sentiment: Grateful for your love. Supplies: Unity Stamp Co. Thankful and Grateful Fall, Clearsnap ColorBox ink, embossing powder, Canson watercolor paper, Altenew watercolor, watercolor brushes, My Creative Time dies and adhesive pearls. Welcome. The MCT team is sharing Day 3 sneak peeks of the 83rd Edition release. 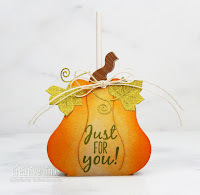 This is a cute table decoration or party favor for Autumn or Thanksgiving. 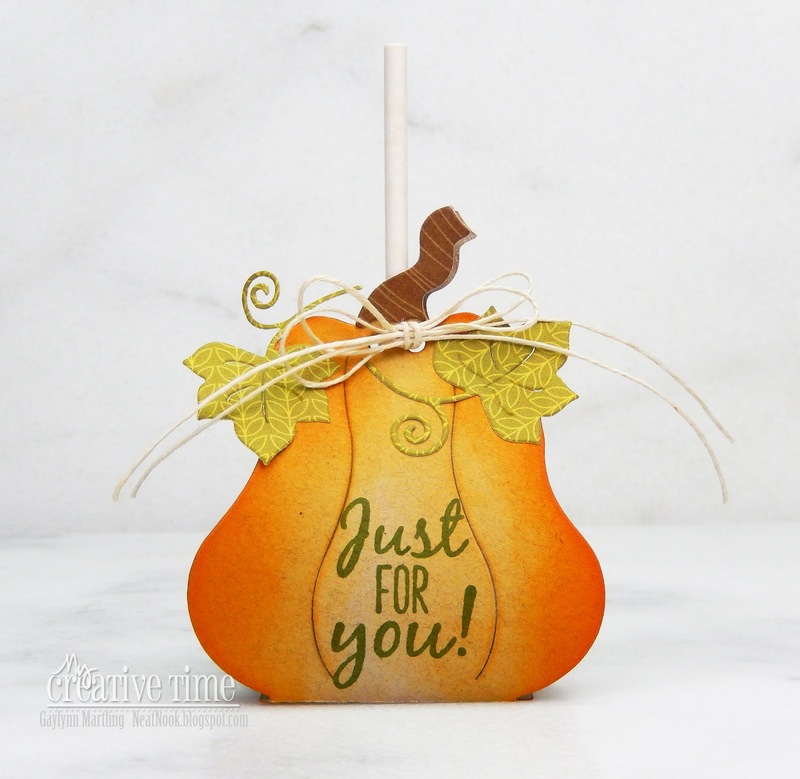 The pumpkin pop holder was die-cut and then the edges were accented with spiced marmalade distress ink. The sentiment was stamped directly onto the pumpkin. For the treat, I added a wrapped chocolate covered coconut macaroon on a pop stick. 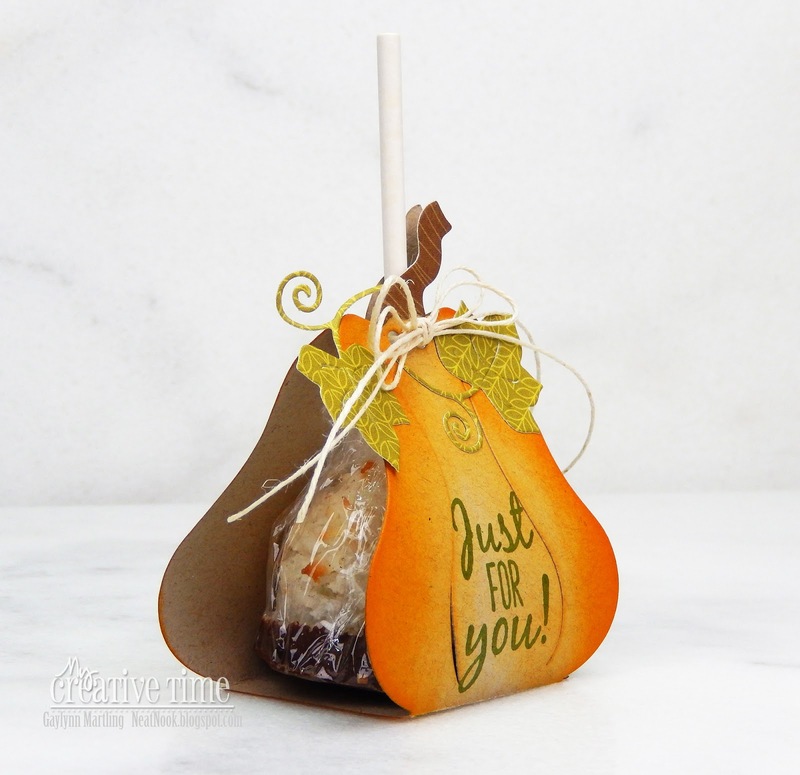 A small treat can be adhered inside if you don't want to use a lollipop or cake pop. Hi there. The MCT team is sharing Day 2 sneak peeks of the 83rd Edition release. 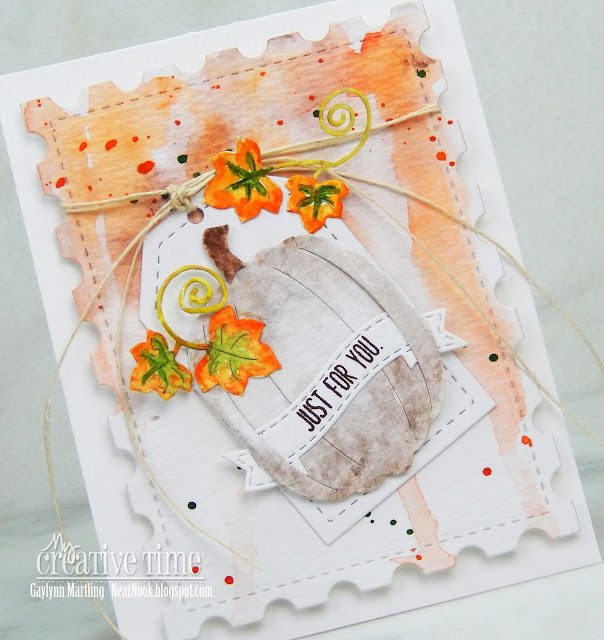 For this card, I added watercolor to the pumpkin, leaves and to the background. I see white pumpkins as well as orange ones. So, I thought I would try using watercolor to make the lighter pumpkin version. 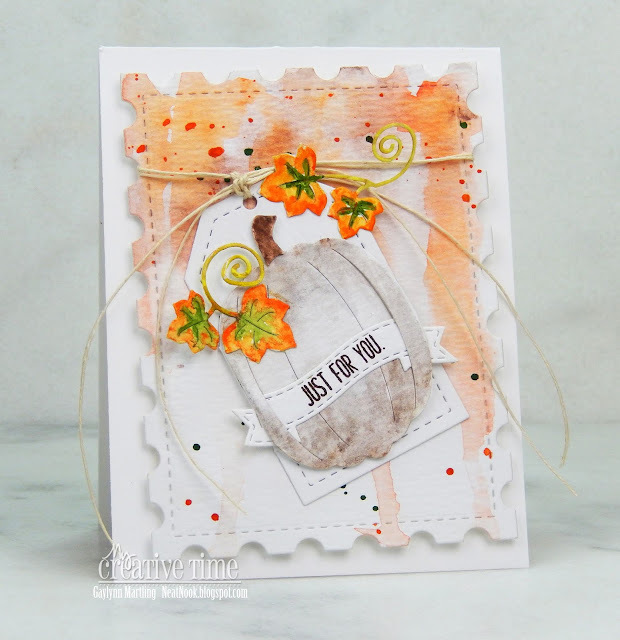 This tag card also includes a tiny sentiment banner weaving through the pumpkin edges. Hooray, the MCT team is sharing Day 1 sneak peeks of the 83rd Edition release. Sentiment: Home baked with love. This is a cookie favor gift wrapped pocket to be given as a thank you, party favor, teacher gift or for any time. It is a sweet way of showing that you care. I included a wrapped chocolate chip cookie inside of the pocket. This pocket was die-cut onto vellum and then assembled. It was decorated with patterned paper and a sweet gift tag. The stamp and die set comes with an assortment of sentiments and icons for handmade gift giving. 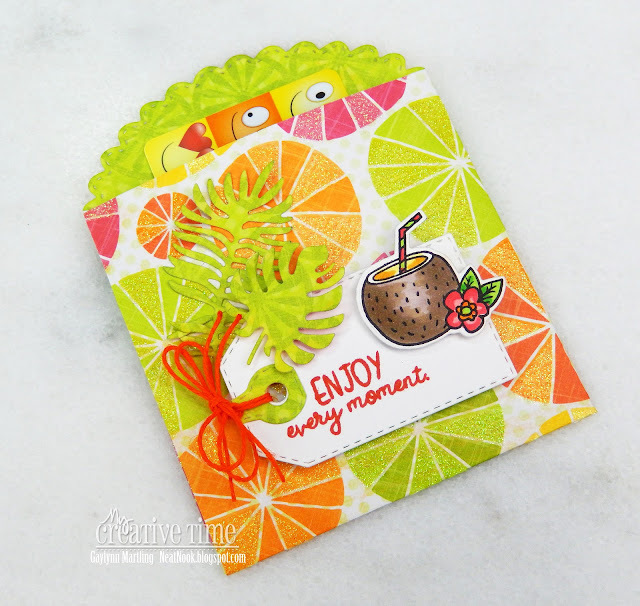 And this layered tag is sure to be versatile enough for any occasion. You are amazing butterflies card. 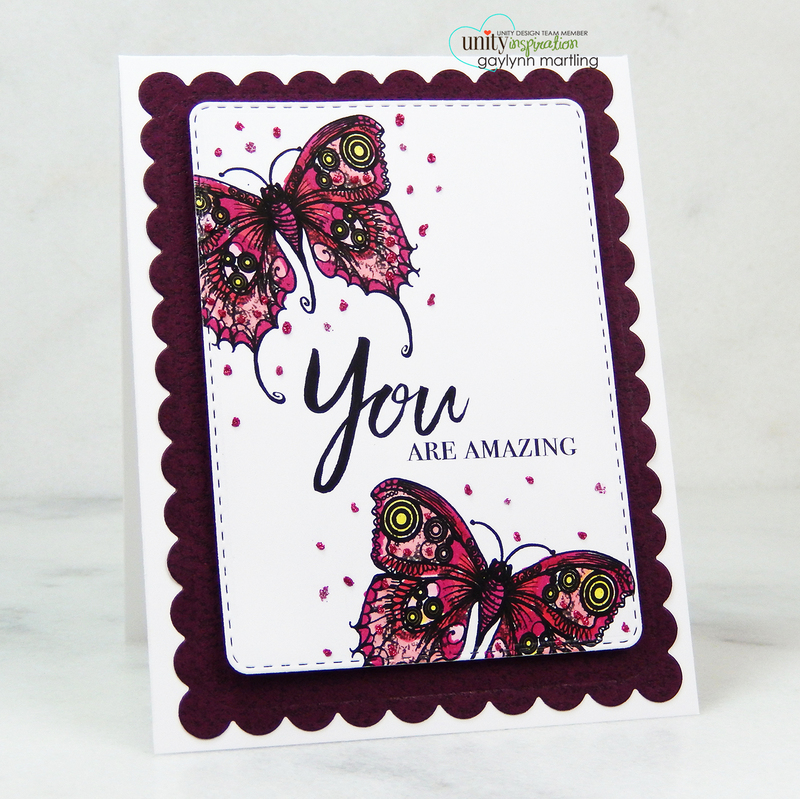 Here is an all occasion card featuring butterflies that sparkle. 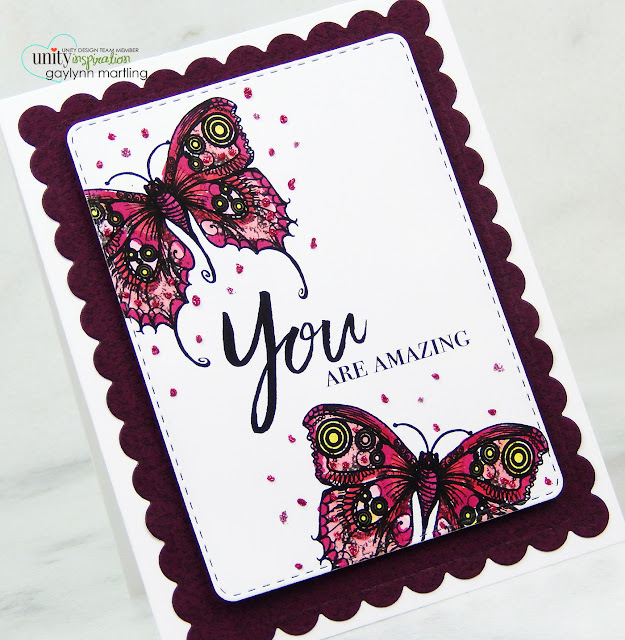 For this card, the butterfly was double stamped and colored in with Copics. For sparkle, I added tiny dabs of glitter glue in two colors onto the butterflies and around them. It really sparkles more in person than what the photo shows. The colors for the frame and the butterflies are burgundy and pink. I made a quick video tutorial showing the process. Supplies: Unity Stamp Co. Crazy and Thankful Grateful Fall; Copic markers R37, RV19, RV04, R32, RV11, Y13; My Creative Time dies, MSC glitter glue and foam tape. That's all for today. Have a great weekend. It is Watercolor Wednesday at Unity. 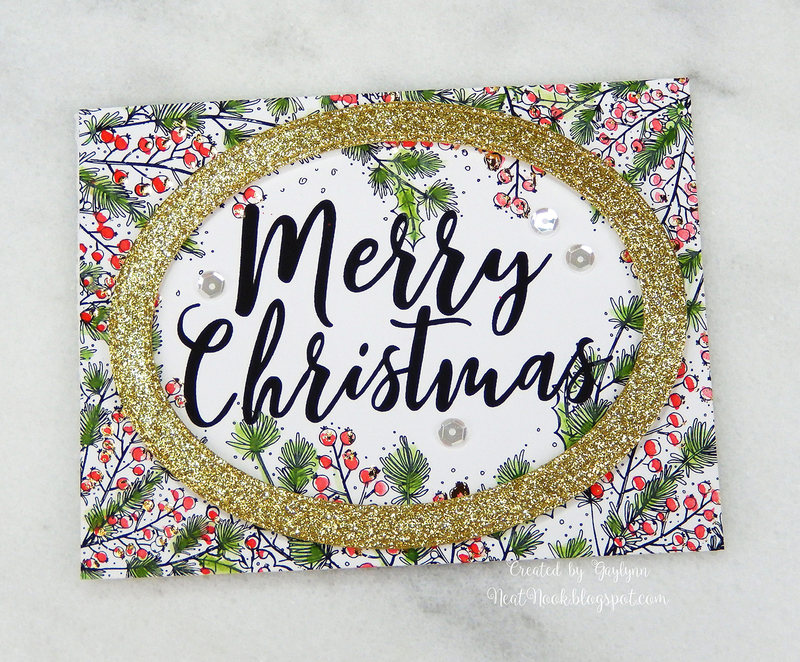 Today, I am sharing a holiday card with touches of gold foil and glitter along with watercolor holly leaves. The gold foil shines much better in person. The full article and tutorial are up on the Unity blog. I also made a quick video tutorial showing the process for this project. 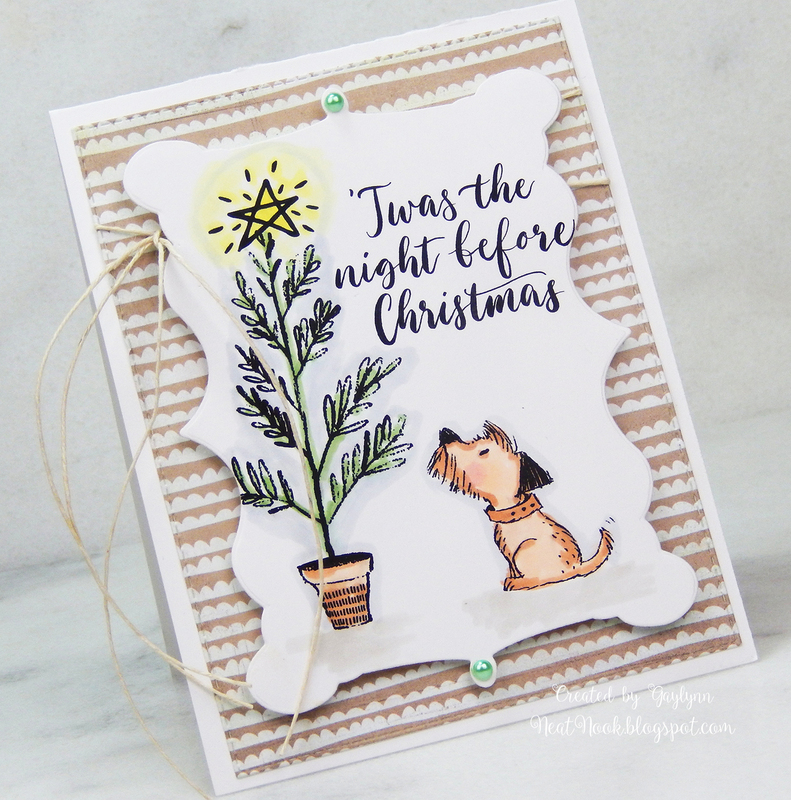 This was pre-stamped with holly leaves and the big sentiment onto watercolor paper. I die-cut a golden glitter frame from glitter paper. Gold deco foil accents were applied to parts of the berries. The watercolor was added using Altenew watercolor 36 half pans along with watercolor brushes. Supplies: Unity Stamp Co. Yuletide and A Christmas Hello; Therm-o-Web deco foil, deco foil adhesive pen, glitter paper, laminator, Ranger watercolor paper and ink; Altenew watercolor 36 half pans, watercolor brushes, MFT dies and Pretty Pink Posh sequins. It is Watercolor Wednesday on the Unity blog. Here are pretty daisies or coneflowers. I am sharing a way to color white flowers to make them pop. The full article and tutorial are up on the Unity blog. I also made a quick video tutorial showing the watercolor process for this project. I used watercolor paper and waterproof ink for the stamping. The watercolor was added using Altenew watercolor half pans along with watercolor brushes. Lots of color layers were added and the background was blended. 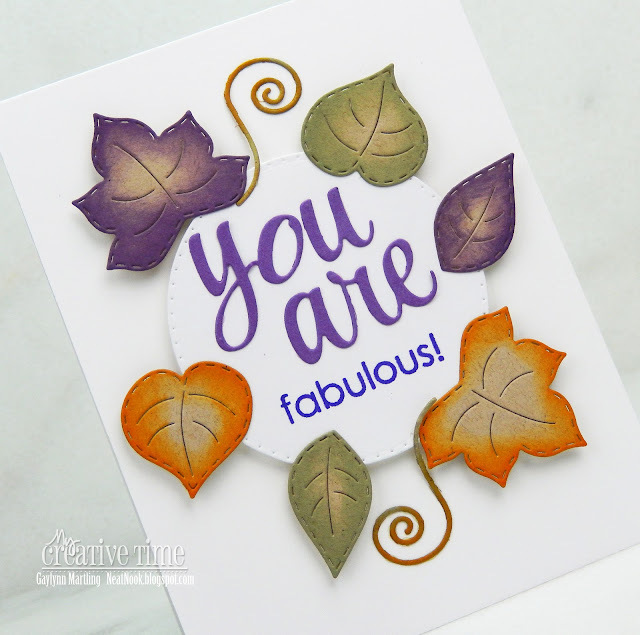 I love how stamping and watercolor can create new looks every time. Supplies: Unity Stamp Co. Charm, Thankful and Grateful Fall and Mourning Dove; Ranger watercolor paper and ink; Altenew watercolor 36 half pans, watercolor brushes, My Creative Time dies and Pretty Pink Posh sequins. 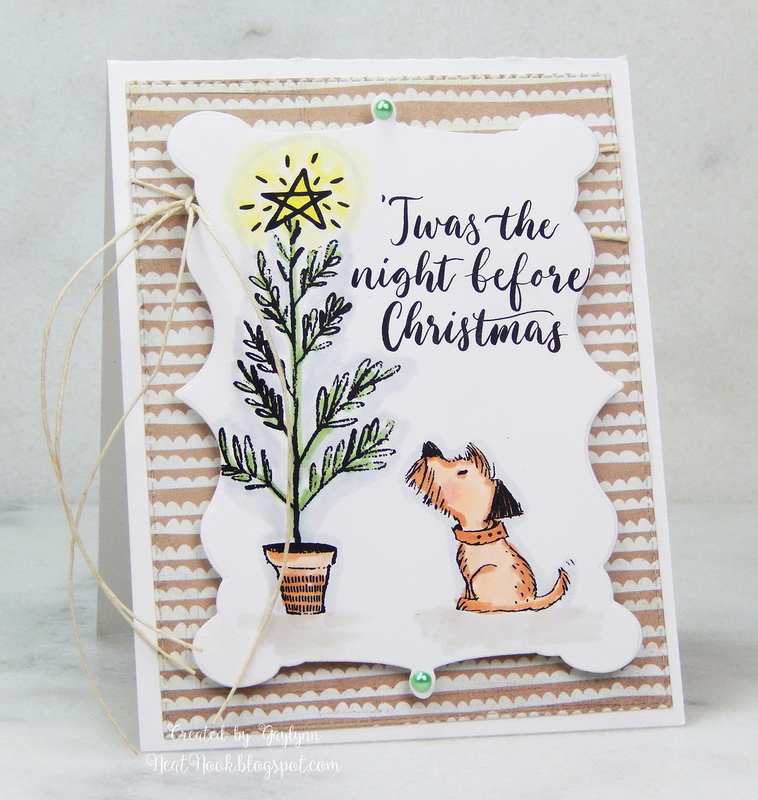 Today, on the MCT blog, we are sharing 3D projects or something other than a card. This is a fun way to wrap a gift card for gift giving. This could be for a birthday or most any celebration occasion. This pocket is also perfect for party favors like wrapped cookies, money, treats or even small notes. I decided to use cheerful double-sided patterned paper, tropical themed stamping and die-cuts. I added a layered sentiment tag for embellishment. 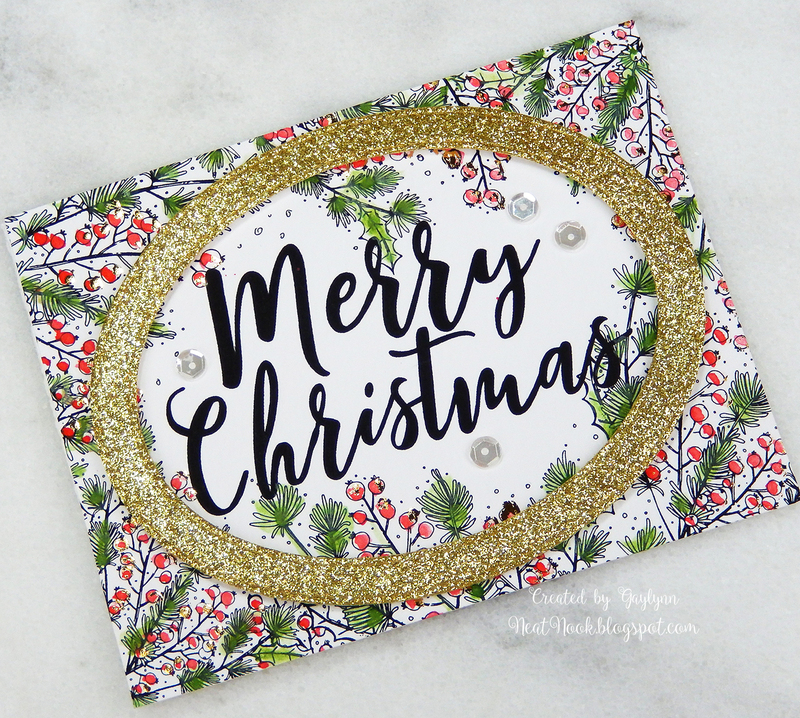 Hi, it's Gaylynn here sharing a sweet Christmas card for the Unity Instagram hop. Sentiment: 'Twas the night before Christmas. This lovely artwork is by Lisa Glanz, the newest Unity Artista. Isn't it the sweetest. I used soft Copic coloring along with a few die-cuts and paper layers to highlight her lovely illustrations. My quick video tutorial shows the process. I would love your comments here. Also, please visit my Instagram @neatnook for instructions. The full instahop begins @unitystampco on Instagram. Four awesome prizes are up for grabs. 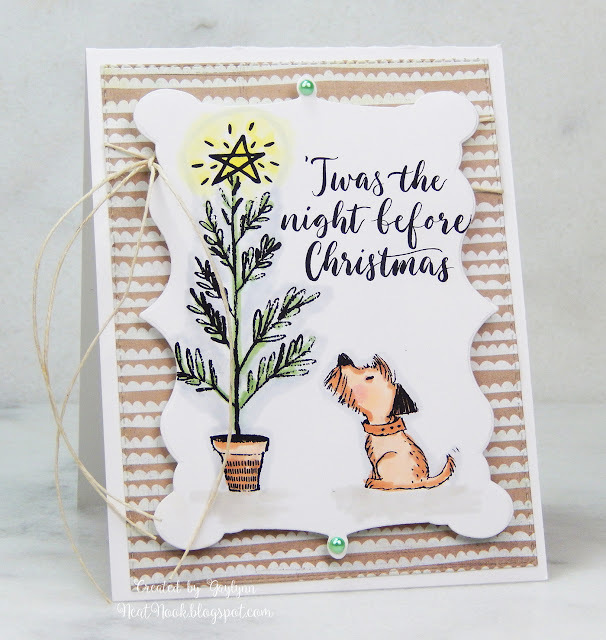 Supplies: Unity Stamp Co. 'Twas The Night by Lisa Glanz, Copic markers G21, G0000, YG0000, Y11, E13, E00, W1, C1, R20; twine, adhesive gems and My Creative Time dies. Wishing you a great day. Hope to see you on the Instagram hop.